Plant a tree in memory of Ruth A. Be the first to share your favorite memory, photo or story of Ruth A. . This memorial page is dedicated for family, friends and future generations to celebrate the life of their loved one. 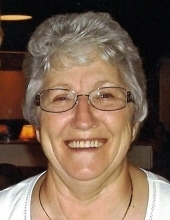 Ruth A. Pluemer, age 78 of Mineral Point, WI, passed away on Thursday, March 28, 2019 at Upland Hills Health in Dodgeville. She was born September 16, 1940 in Potosi, the daughter of Walter and Ila (Clauer) Schramm. Ruth attended the Rockville country school and graduated from Potosi High School in 1961, before going on to further her education at Southwest Technical College in Fennimore. She worked several jobs throughout her life: Burgess Battery Factory, as a CNA specializing in Eldercare, and at Oscar Mayer. Ruth was involved in bowling, a library club, making ceramics, and upholstery. She also enjoyed sewing and patching, gardening and canning, and cheering for the Green Bay Packers. In her free time, Ruth liked to take walks and go on Sunday drives. She was an awesome cook who made sure no one ever left her house hungry. Ruth was a woman you could count on when you needed her, and she always went out of her way to help someone in need. Ruth’s greatest love was her family – her kids and grandkids were the center of her life. Ruth is survived by two sons: Jeff and Scott Pluemer; five grandchildren: Deidra (Eric) Wolf, Dallion (Jami), Dustin, Kyle, and Faith Pluemer; eight great-grandchildren; eight siblings: Donna Irish, Charles (Nancy) Schramm, Walter (Lennie) Schramm, Jr., Karen Eck, Doug (Pat) Schramm, Greg (Carol) Schramm, Tim (Theresa) Schramm, and Kimberly (Leonard) Jerrett; and many nieces and nephews. In addition to her parents, Ruth was preceded in death by her sister, Betty Hall; two brothers-in-law: Virgil Eck and Keith Irish; a niece, Julie Hall; and four nephews: Michael Schramm, David, Daniel and Ronald Hall. Funeral services will be held at 10:00 a.m. on Wednesday, April 3, 2019 at the Martin Schwartz Funeral Home and Crematory in Lancaster with Pastor Karsten Snitker officiating. Burial will be in British Hollow Cemetery, Potosi Township. Family and friends may call from 4:00 p.m. until 7:00 p.m. on Tuesday, April 2, 2019 at the Martin Schwartz Funeral Home and Crematory, and on Wednesday, April 3, 2019 from 9:00 a.m. until the time of service at the funeral home. In lieu of plants and flowers, a Ruth A. Pluemer Memorial Fund has been established. Martin Schwartz Funeral Home & Crematory in Lancaster is entrusted with her services. To plant a tree in memory of Ruth A. Pluemer, please visit our Tribute Store. "Email Address" would like to share the life celebration of Ruth A. Pluemer. Click on the "link" to go to share a favorite memory or leave a condolence message for the family.